Asset management for today's stock market investor. 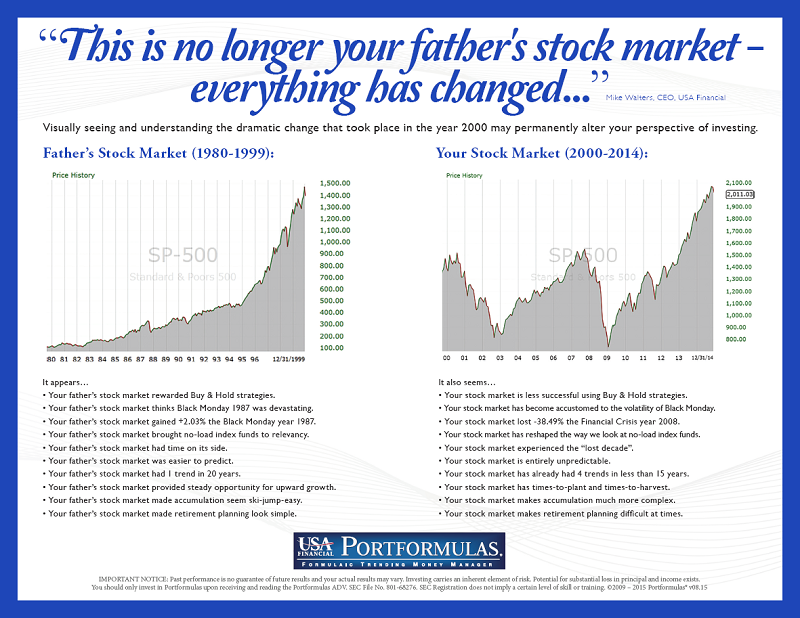 This is no longer your father's stock market — everything has changed"
USA Financial Portformulas is a private money management firm that manages client portfolios by implementing formulaic strategies that have been specifically designed to remove emotion from the investing equation. Founded on the belief that the stock market has trends, our strategies seek to help investors find the right balance between taking investment risks and managing investment risk. The 21st century has introduced new challenges for investors. In less than two decades, four distinct stock market trends materialized and challenged the emotions and risk tolerance levels of millions of Americans. Our goal is to help investors make sense of investing in today's stock market. Our clients are individuals who recognize that the stock market has changed - and that their investment strategy ought to follow suit. Our advisors recognize the importance of integrating risk management into the portfolios of their clients.